The new employee policy for the retail giant extends family leave. Workers' advocates, though, say they're skeptical. Wall Street was abuzz on Thursday, Jan. 11, with new reports of Wal-Mart Stores Inc.'s (WMT - Get Report) latest pay bump and benefit changes. While analysts are already lauding the country's largest employer for using tax reform benefits to reinvest in its business, workers' advocates are skeptical of Walmart's new maternity leave policy, pointing to its track record in skirting existing benefits required under federal law. "This is great news for Walmart employees, but we're taking it with healthy skepticism," said Elizabeth Gedmark, the senior attorney at A Better Balance, a workers' rights advocacy group in New York and Nashville specializing in family issues. In addition to raising wages to $11 per hour and doling out a one-time $1,000 bonus for long-time employees, Walmart announced Thursday that it's expanding parental and maternity leave coverage, offering 10 weeks of paid maternity leave for full-time hourly associates and six weeks of paid parental leave. Under its previous policy, full-time hourly associates were granted six to eight weeks of half-paid maternity leave and no parental leave, according to a Walmart representative. 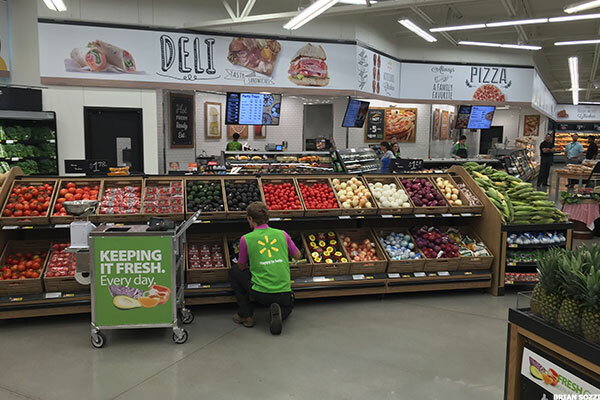 The new benefits are extended to employees that have worked at Walmart for a year or more. No additional details have been confirmed, the representative said. These changes, when implemented, would make Walmart one of the leading retailers in providing comprehensive family leave for hourly sales associates, according to a May report from PL+US, a nonprofit advocating for paid family leave in the U.S. Yum! Brands Inc. (YUM - Get Report) , which owns Taco Bell and KFC, offers no paid family leave for field employees, for instance. Kroger Co. (KR - Get Report) offers three weeks of paid leave for sales associates. "Today, Walmart took a step in the right direction for low-wage working families and provided a huge win for hundreds of thousands of working families with a parent at Walmart," PL+US executive director Katie Bethell said in a statement. "But while this is a huge step," she added, "Walmart and the U.S. still have a long way to go before every American has paid family leave. ... Walmart still leaves part-time workers -- who make up half their workforce -- completely out in the cold." Moreover, Walmart's long history of alleged worker mistreatment undermines the sincerity of its new policy, Gedmark said, pointing to her organization's outstanding legal complaints against the company. "A lot of the time, Walmart's pregnancy discrimination takes place before an employee gives birth or returns to work after maternity leave." In one class action filed last May, a former Walmart employee from Jacksonville, Fla., was fired after requesting information concerning maternity leave and injuring herself during her pregnancy. One manager, in fact, refused to accept her doctor's note recommending against heavy lifting, telling her "that she had seen Demi Moore do a summersault on television toward the end of her pregnancy, so pregnancy was 'no excuse," the complaint shows. The lawsuit in the U.S. District Court for the Southern District of Illinois alleges Walmart failed to provide pregnancy accommodation for up to 20,000 employees between 2013 and 2014, thereby violating Title VII of the Civil Rights Act of 1964 on three counts. Last month, Gedmark's organization filed an Equal Employment Opportunity Commission complaint against Walmart on behalf of another pregnant employee who was pushed into an unpaid leave of absence when she submitted a doctor's note that recommended against heavy lifting. Walmart has long been accused of penny-pinching its employees through limiting work hours and refusing doctors' notes, but the company has made improvements in recent years, such as raising the starting wage to $10 and allowing employees access to pay between paychecks. The Bentonville, Ark., chain could not immediately be reached for comment on the allegations. Walmart shares have increased by more than 46% over the past year as sales continue to climb. Its stock was upgraded by multiple analysts following Thursday's announcement. Oppenheimer, for instance, upped the company's price target from $103 to $113, deeming the wage increase a possible "tailwind to consumer spending." Consumer Edge Research also upgraded Walmart's target price to $105 from $90. Walmart shares were up 0.6% to $100.30 on Thursday afternoon. 10 Haunting Photos From Sears and Kmart Closings Sweeping the U.S.